Goodness me, how on Earth are we already at the end of September!? Madness! This has been a mixed month for me, finishing my Masters course and starting to look for grown-up jobs; I've secured a Christmas temp job at Debenhams but am still looking for something in my field, so if you're after a Neuroscientist, let me know! It was also my birthday; I turned 22 last Friday and spent the day visiting both my grandparents and a few Aunties and Uncles - my Gran is 90 in November, how impressive is that!? Anyway, enough of my rambles, and onto the products I've finished in September. Botanics Hot Cloth Cleansing Balm This is my second pot of this Cleansing Balm and I've still enjoyed using it, finding it really gentle and nourishing for my skin as well as doing a really good job of removing my make-up. However, I've also discovered a couple of new cleansers during the month, including the Super Facialist by Una Brennan Skin Renew Cleansing Oil and Korres Sage & Salicylic Acid Regulating Cleansing Gel, which seem to be working better for controlling my oily, blemish-prone skin, whilst still protecting it as the weather turns cooler. Repurchase? Unsure; maybe, depending how I feel about the Super Facialist Oil by the time I've finished it. The Body Shop Tea Tree Pore Minimiser You could be forgiven for thinking I was on commission for this product given how much I recommend it; I mention it in pretty much every #bbloggers chat, I just love it! It's perfect for helping to shrink pores (as the name suggests) and providing a lovely smooth, even surface to apply make-up over. Because it contains Tea Tree, it also feels like it's doing some good for my skin, rather than just clogging my pores with silicon as some primers can feel like. Balance Me Rose Otto Intensive Lip Salve I did like this, although the scent/taste wasn't my favourite for a lip balm. It did do a wonderful job of hydrating and smoothing my lips, though, and the ingredients list was pretty impressive. As I mentioned in my full review, though, I feel that its full-size price tag is a bit steep, which is why I won't be repurchasing. 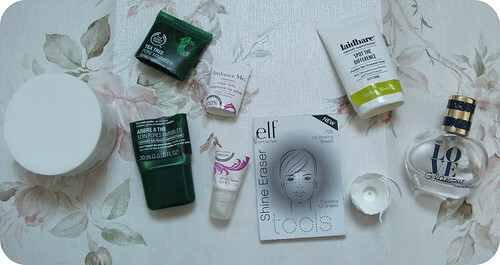 ELF Shine Eraser Blotting Sheets I bought these ages ago and have sort of gone through phases of using them and not using them; I've finally had a last push to get them finished. They absorbed oil, but I found I needed five or six to do my whole face; I do have exceptionally oily skin, but that does seem excessive even for me, and with other brands two or three is generally sufficient. For that reason, I probably wouldn't repurchase these particular blotting sheets. Laidbare Spot The Difference I really enjoyed using this under my moisturiser of an evening and did find that it reduced the number of spots and blemishes which appeared. 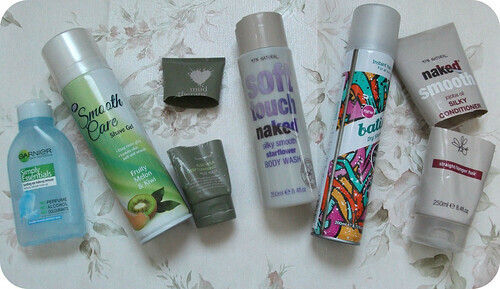 I've got a couple of other products to finish up first, but I probably will repurchase this once those have gone. Next Love Glamour Eau de Toilette I bought this on a whim in Next about two years ago as I loved the scent, and I've enjoyed using every drop. I'm not even going to attempt to describe it as I'm awful at understanding perfume, but it was fruity and girly and very much a 'me' scent and I'm sorry to have finished it, especially as I don't think it's available any longer! Repurchase? I don't think I can! Garnier Simply Essentials Soothing Eye Make-Up Remover I really liked this eye make-up remover, I found it gentle on my eyes and effective at removing all but the most stubborn of mascara (Benefit They're Real! I'm looking at you...) - even that came off after soaking for ten seconds or so. Boots Smooth Care Shave Gel I've strayed from my usual Gillette Shaving Gel as this was on offer in Boots and smelt absolutely lovely. I feel like the scent has fermented a bit over time, as weird as that sounds, as towards the end of the can it just smelt a bit off. Nonetheless, it did the job for shaving my legs, and I've already repurchased in the Sensitive version. Superdrug Mud Therapy Aloe Vera Deep Cleansing Mud Mask This is another one I've had ages, it was an absolute bargain at about £2 or £3 and has lasted really well; you don't need very much to cover the face, and it does a great job at absorbing excess oil and unclogging pores. I did feel like my skin was cleaner after using this, and it didn't dry my skin out either, like some mud masks sometimes can. Repurchase? Maybe; I have a huge stockpile of face masks I'm currently trying to clear, but this is one I'd consider buying again in the future. Soft Touch Naked Silky Smooth Starflower Body Wash I love the cinnamon-scent of this body wash, as well as the fact that it's eczema-friendly and doesn't irritate my skin. This has become a staple for me and will probably be featuring in my Empties posts most months. Batiste Graffiti I bought this purely for the sake of trying a new fragrance and I have mixed opinions about it; whilst it's a nice smell, I don't love it like I do the Tropical one, and for that reason I probably wouldn't buy it again unless it's all that was available. Aside from the scent, it's the same old Batiste really, doing a great job of perking up limp hair and extending the time between shampoos. Naked Smooth Jojoba Oil Silky Conditioner Aside from the fact that this is too thick to easily squeeze from the tube, I absolutely love it! It leaves my hair soft, smooth and manageable, and helps stop it drying out and splitting which, being waist-length, my hair is somewhat prone to doing... It also smells beautiful and lasts for absolutely ages. 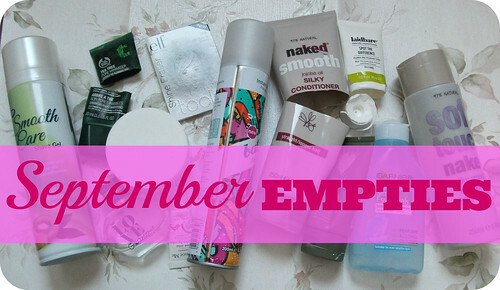 So, they're my September Empties! What have you finished up this month? Have you tried any of these products? Which would you most like to try? I hope you've all had a wonderful month! So impressed to see how many products you have used up!! Kudos..